Apologies to those patient readers who were expecting a blog post last week. Real life is unimaginative and unforgiving. It left me without time to peice this post togethor until now. To complete the top four sections of the D&D 5e monster stat block we need to understand Armor Class, the Miscellaneous Stats that a creature has and set appropriate values on our Example Monster. Monster Armor Class has a close relationship with PC Attack Bonus. While our small sample size does present some difficulties here we can do some analysis on PC Attack Bonus to help us leverage value from the samples we have. Yes, there will be some element of uncertainty, but it will be smaller than many people expect. If we plot all of the monster AC values by level we get an interesting little scatter graph, with most of the data on the left hand side because of the predominantly low level nature of our sample data. A trendline will be less impacted by this low-level skew, however the sparseness of higher level data does tend to make the trendline somewhat unreliable. But remember, that's why we are constraining ourselves to CR10 and below. What's important here is that we get a sense of roughly where the average is for the data we have, what we think the trendline should look like and what kind of variability we should expect to see at a given level. 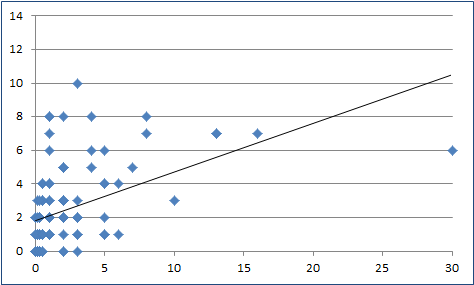 We can also average monster AC data and plotting the results on another graph, adding a trendline to this graph too. We can then consider the similarities and differences between the two, along with what these might signify. As you can see this tightens up the clusters and brings the lower level data into sharper focus. Unfortunately this doesn't directly help with our higher level samples. That said this is probably enough to crack this particular nut for CR0 through CR10... That is, if we do some analysis of related PC data and then leverage off it. To achieve this I had to go and analyze Attack Bonus data for PC Classes, as I had previously done for PC Damage in order to properly analyze monster Hit Points. Since I was doing this anyway I also did the initial analysis on PC AC, updated my previous PC data spreadsheet and floated a new PC Stat Curves thread on the Wizards of the Coast forums. Hopefully this proves useful to others and you are welcome to look at it yourself and comment back on that thread, if you are so inclined. This curve is particularly useful for several reasons. It almost perfectly matches the projected progression, having a 0.2 variance that only tells at four points due to rounding - levels 5, 9, 10 and 13. AT these points the rounded value slips one above or below the actual PC class values. I think that falls with the margin for error in the observed PC data itself. The progression below level 1, where we might match with CR, looks appropriate. Past level 20 the progression becomes quite shallow, which should be appropriate for building CR21+ creatures. Additionally the equation is one of the least complicated polynomials. It seems fairly elegant to me. Now, what should an average D&D 5e character roll to hit an average CR-equivalent creature? Subtracting our average PC Attack bonus from the AC of an average CR-equivalent monster we see that it's very close to an average of 9 for our level 1 through 4 sample range. I guess it's possible that it could be an 8 or a 10, but we'll need the kind of data the Monster Manual will supply to work that out for sure. So for now we'll go with a 9. The table on the left displays these values, rounded to the nearest integer, for CR0 through CR10. That said it's really important to understand that the there appears to be a margin of at least +/-5 on this average. So it's perfectly legitimate for a CR1 monster to have an AC anywhere from 9 to 19 or for a CR10 monster to have an AC between 12 and 22, without compensating significantly in any of it's other stats. Furthermore this is a guideline only and experienced 5e monster designers shouldn't have any qualms about going even further outside the boundaries, though they should probably ensure they do apply some kind of mitigation elsewhere in their creature. More inexperienced monster designers should probably aim to stay in or near these boundaries until they gain some confident building creatures with this system. You see, the D&D 5e monster system "feels" very strongly like a "rule of sense" type system. The emphasis is more on the art of monster design than in D&D 4e, for example. And this is an area where Bounded Accuracy really makes itself felt. Prediction: Based on my analysis so far I think it's pretty obvious that there is a progression, flattened though it may be, for AC and, by inference, Attack Bonus. On top of that I reckon some folks are going to cry foul when they realise that there is the case. Those people will be missing the point. Bounded Accuracy isn't about there being no progression on this axis. It's about the progression being quite muted so that monsters can stay relevant across more levels. Prediction: I think average monster AC will peak at about 22 around level 25. In general the miscellaneous statistics (those in the same section as Challenge) seem to follow the rule of common sense. A creature native to the Elemental Plane Of Fire is probably immune to fire damage and an especially sneaky creature in all probability has proficiency in Stealth. So the main driver for miscellaneous stats does appear to be logic. Additionally it's pretty obvious that D&D 5e monsters strongly leverage off a templating system and this starts to become evident in miscellaneous statistics. Undead are immune to poison damage and both the charmed and poisoned conditions, for example. Since the use of templating layers up attributes on a creature systems that use it usually cautioned not to apply too many templates as the creature may become overpowered for it's level (or CR in the case of D&D 5e). The impact on analysis is to increase the observed variability of creatures, which is consistent with my observations. With this all said there does appear to be a general progression of these stats as CR increases. Whether this is by design or incidental, simply being a result of increasing complexity and toughness, is a moot point. The pattern is present and, given sufficient data, it can be enumerated. But do we have enough data? Well yes and no. The release of the Player's Handbook, the update of Horde Of The Dragon Queen and certain spoilers from the Monster Manual have helped and those stats have been included in this part of this post. We can be fairly confident of this pattern out to CR10 and I'll illustrate why shortly. By experimenting with different ways of combining the miscellaneous stats I came up with a method that keeps the variance minimal and makes sense - simply add up the number of Saving Throws, Skills, Damage Resistances and Damage Immunities the creature has, arriving at a "misc stats score". This method should be considered provisional and how it actually fits with the build process Wizards of the Coast will present remains to be seen. That said it does appear to work with the current crop of monsters. 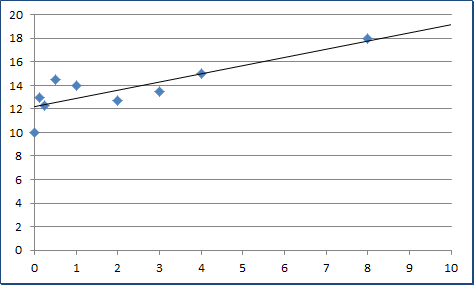 Creating a scatter graph of these scores and placing a linear trendline on the graph suggests an interesting pattern. 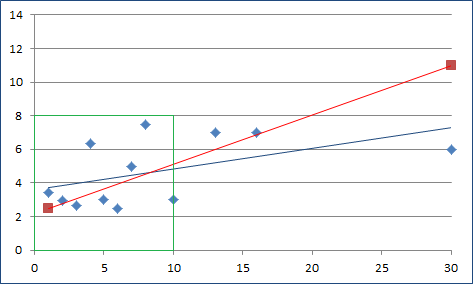 Based on this graph CR1 creatures typically score just over 2 and CR30 creatures score around 11. And we can see at the lower CRs that the variability seems to be about +/-5. Of course, the dearth of higher level data will generally cause that end of the trendline to be unreliable and to wander. That's why we aren't looking past CR10 until we have more data. So how can we gain some confidence in the lower level data? Let me illustrate the approach I have used in this particular case. 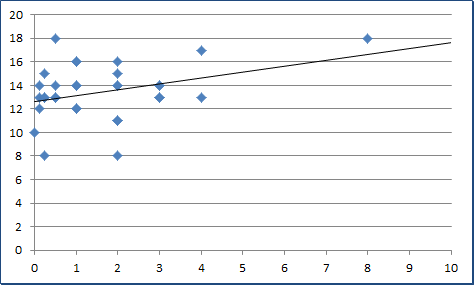 What I did was generate a pivot table of average by CR, scatter graph that and place a linear trendline on the graph. See the Blue data points and blue trendline on the Monster Misc Stats Score Average figure. As you can see this produces a fairly different trendline to the preceeding graph, primarily on the righthand side, where data is most sparse. 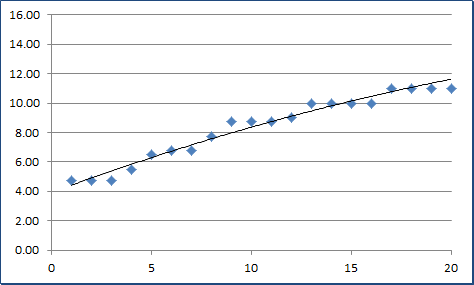 This trendline would suggest CR1 creatures score just under 4 and that CR30 creatures scoure about 7.5. So how do we reconcile these? Splitting the difference is a pretty common-sense approach. Past CR10 things start to become increasingly uncertain. Restricting ourselves to CR10 and below (check out the green box) we can see that the margin for error is very low and that we can have high confidence in this approach at those levels. Saving Throws Monsters may add proficiency to their saving throws in the same way as PCs. Counts towards Misc Stat Score. Skills Skills are calculated for monsters in the same way as for PCs. Monsters may add their proficiency modifier to skills they are trained in. Damage Vulnerabilities These are pretty rare in D&D 5e, with only 1.8% of current samples having a vulnerability. These don't seem to be used to compensate for other strengthening attributes, though one could use them to provide an Achilles Heal for a creature that is particualrly strong for it's CR. Best advice here is to only apply a vulnerability where there is an especially compelling reason for your monster to have one. Does not count towards Misc Stat Score. Damage Resistance Damage resistance is pretty common in 5e. Note that resistance to bludgeoning, peircing and slashing from nonmagical/non-adamantine/unsilvered weapons seems to be the replacement for the "immune to damage from nonmagical weapons" in older editions and counts as one Damage Resistance. Damage Immunities In D&D 5e these are rarer than Damage Resistances, but 19.4% of the current sample have them. Given they are somewhat stronger than an equivalent resistance I had hoped weight them as "worth" more than resistances. However, this simply introduced greater skew and variability. I'd suggest that best advice is to go light on Damage Immunities, but to use them where there is a compelling reason in your creature's background. Condition Immunities Creatures with resistance or immunity to a particular damage type normally also have immunity to it's corresponding condition, if there is one. Otherwise these should be applied where there is a compelling background/story reason. Senses Most creatures have one additional sense. Some have none, some have two or even more. There doesn't seem to be any consideration here beyond story/background. Languages The number of languages a monster knows seems to be purely defined by story/background considerations, or "the rule of sense". As we can see "the rule of sense" and the concept of "the art of monster building" are alive and well in D&D 5e. And along with those all the baggage and concerns from earlier editions that had the same focus. Note that I have hand-editted the vlaues for CRs of less than 1 to save complexity. We could produce a solid match using a Power or Poly2 formula, but I don't think this rates the extra time that would be involved. Prediction: I think Monster Manual analysis will confirm we are on the right track here and that we'll find that CR30 creature do have an average score around 9 using this approach. Prediction: I expect the Dungeon Master's Guide's section on monster construction will suggest using "the rule of sense". If we recall our Glass Canon with an Arcane Fire theme we'll remember it isn't going to be especially hard to hit, but focusses on dealing damage. That doesn't mean the Pyromancer won't have a couple of little tricks to make it a little more viable. Our plan is for melee characters to get close and then for it to go down quickly. The Pyronmancer is unarmored so adds it's Dexterity Modifier to it's AC. This puts it on the low side of appropriate for it's CR, which is fine. As a CR5 creature it'll typically have 4 significant miscellanoues stats, though it may have anywhere from 0 to 9. Now, what is thematic? As a caster with a casting attribute of Intelligence it makes sense go give it proficiency on that, though proficiency on Dexterity is also appropriate and helps encourage melee characters to deal with it, so I have added both... After it's not that common for monsters to make intelligence saves. Arcana is an obvious choice for Skills, though of rather limited application for a monster. We'll also give the Pyromancer something useful in combat - proficiency in Perception. The choice of fire resistance is an obvious one, given the creature's theme. Given the Pyromancer is human I'll give it Common and an additional language. Ignan, the language of Fire Elementals and their kin, seems like a good fit. Part 4: Construction: Ability Scores & HP Master Index Interlude: A Bunch Of Monsters! D&D 5e Monsters: Interlude: A Bunch Of Monsters!